thinksound ms01 in-ear headphones make their UK debut at £115 | What Hi-Fi? US-headphone brand thinksound has introduced its latest in-ear headphones, the £115 ms-01, to the UK market. Voiced by audio engineer and thinksound CEO Aaron Fournier, and designed in collaboration with Grammy-Award-winning musicians and producers, the ms01s have an eco-friendly wooden housing fitted with an 8mm driver. 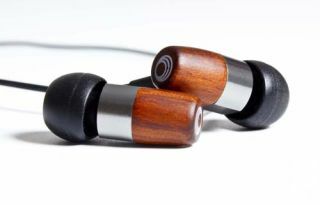 Four sets of flexible silicon ear fittings come as part of the package, and the chocolate-coloured, hand-crafted wooden housings are fitted with gunmetal-finished aluminium baffles. The lightweight (9.5g), sweat-resistant design makes the ms01s suitable for use in the gym, while out jogging or while participating in other sports, says thinksound. The 'Active Lifestyle Ear Hooks' (below) mean they won't slip off, even during strenuous exercise. Further enhancing their eco-friendly construction, owners get a a cotton carrying pouch and tangle-resistant, Kevlar-reinforced PVC-free cable fitted with a stereo, gold-plated 3.5mm plug.